The Cod. Wars have been fought over it, revolutions have been triggered by it, national diets have been based on it, economies and livelihoods have depended on it. To the millions it has sustained, it has been a treasure more precious that gold. This book spans 1,000 years and four continents. From the Vikings to Clarence Birdseye, Mark Kurlansky introduces the explorers, merchants, writers, chefs and fisherman, whose lives have been interwoven with this prolific fish. He chronicles the cod wars of the 16th and 20th centuries. He blends in recipes and lore from the Middle Ages to the present. In a story that brings world history and human passions into captivating focus, he shows how the most profitable fish in history is today faced with extinction. "To go out and buy a book on the subject (of cod) is to invite glances of suspicion. While a few eccentrics might think this is a good reason to purchase several copies, for the rest of us it requires a certain leap of faith. Cod...amply rewards such a leap. 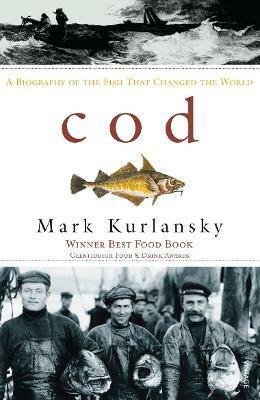 It is compact and beautifully produced"
Mark Kurlansky is the author of several bestselling non-fiction titles including Cod: A Biography of the Fish that Changed the World (winner of the Glenfiddich Best Food Book Award), The Basque History of the World, Salt: A World History, 1968: The Year that Rocked the World, a short story collection The White Man in the Tree and a novel, Boogaloo on 2nd Avenue.